What if I told you that you can take your favourite deep fried recipes and make them in a healthier way without losing any of the flavours? Are you feeling some doubt? No worries, I was a doubter as well. Perhaps it’s because I’ve never, EVER been able to make anything BUT soggy sweet potato fries until now. I have officially mastered the art of a crispy sweet potato fry after trying the Philips Airfryer. 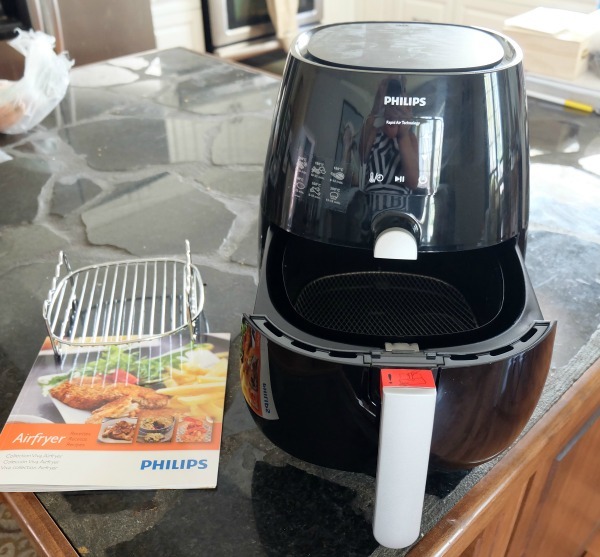 When Philips offered me the Airfryer to try out, I had no idea if I’d be impressed but after using it for a few days I am pleasantly surprised. For Mother’s Day each year we head out to enjoy some time together on our back deck. On of my favourite meals is sweet potato friends and chicken drumsticks which would be deep fried if I had my way…alas because I am focusing on my health, we haven’t been having them this way. Yet another reason I was eager to try this baby out! The Philips Airfryer uses a new technology which circulates hot air with speed and precision, cooking the food using LESS oils. The most oil you’ll use is just 1 tablespoon…compare that to a whole pot to deep fry and you can begin to imagine the health benefits. Combine this with simple clean-ups and you’ll understand why I was excited to try this baby out. The unit has a digital touch face that can memorize your favourite settings. Adjustable temperature control can be set up to 390 degrees F and the timer can be set for up to 60 minutes of cooking time. The basket is dishwasher safe, making clean up easy. Inside the box there is a rack which you can use inside the basket to layer foods and a recipe book which is worth checking out – it even has desserts! The very first thing I made was sweet potato fries, how could I not after far too many batches going soggy in the oven. I preheated the Airfryer to 200 degrees F. Then I cut up my sweet potatoes into sticks, tossed them in a teaspoon of coconut oil. Once the Airfryer was ready, I put them into the basket of the Airfryer. I set the timer for 9 minutes and closed the Airfryer. When it beeped, I was greeted with crispy sweet potato fries! After a bit of salt and a side of aioli I was ready to eat. It really was that simple. There was just a wee bit of oil in the bottom of the drawer which was simple to clean. Next I wanted to try some chicken. 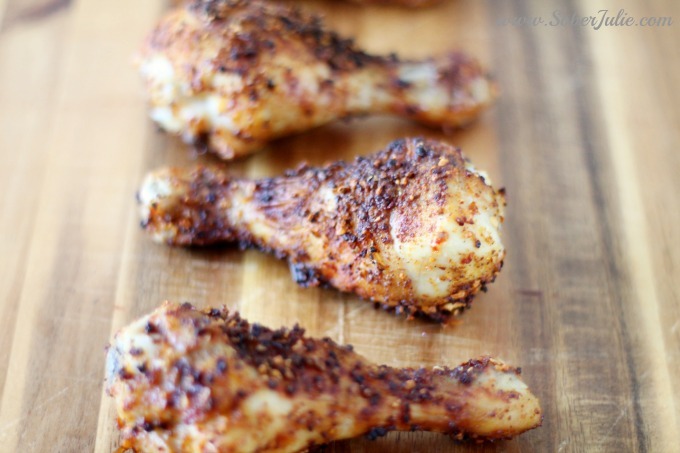 One of our FAV dishes are chicken drumsticks and for this recipe, I used a rub. 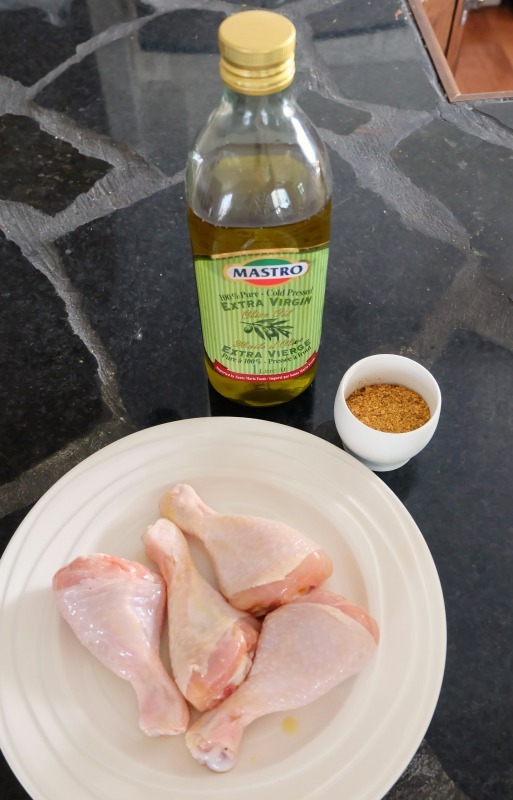 I covered the drumsticks in a bit of olive oil (about a teaspoon) and rubbed the spices all over. 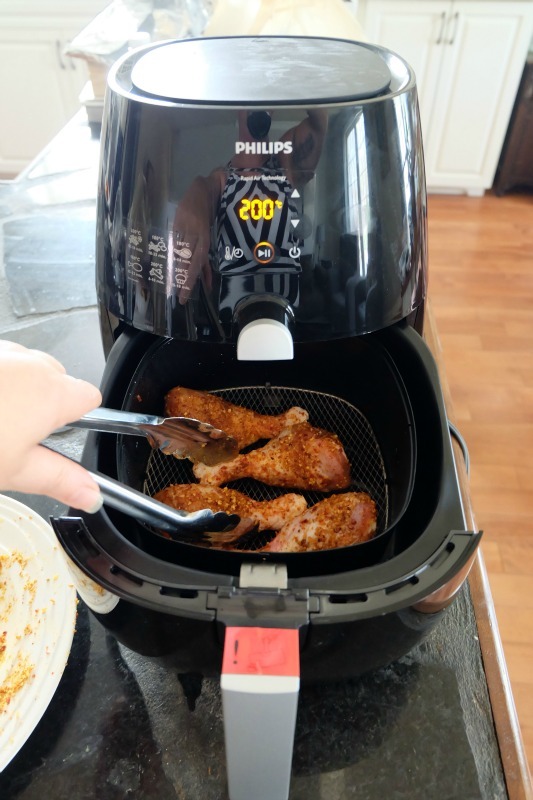 At this point I preheated the Airfryer to 200 degrees C (390 F) and once it was ready (after about 3 mins) I placed the drumsticks into the basket, set the timer for 10 minutes and closed it up. After those 10 minutes, I reduced the heat to 150 degrees C (300 degrees F) and set it for another 8 minutes. When the timer rang and I pulled out the basket, I was greeted with these gorgeous drumsticks! The meat inside was fully cooked and super moist! This was another simple dish that is packed with flavours and healthier than a deep-fried version. My opinion? Well this unit is simple to use and produces healthier options which I LOVE. I have a long list of recipes I plan on trying, but for now I’d definitely give it a thumbs up! Disclosure: I received this product in order to perform this review, all opinions are my own. 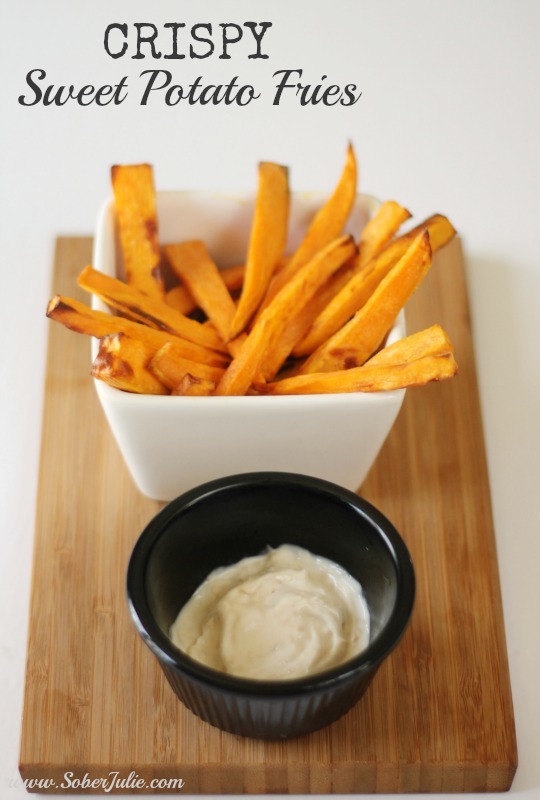 Oh yum looks so good, never has sweet potato fries or a sweet potato will have to try them! Looks like a great machine! I’ve been wanting to try one of these machines for so long! 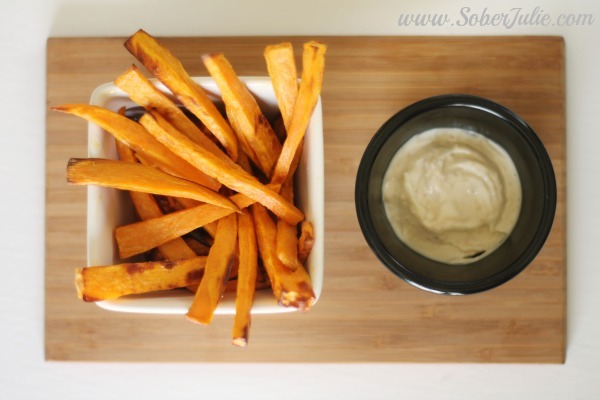 The sweet potato fries look amazing! Jus the review i’ve ben waiting for, Thank you Julie. 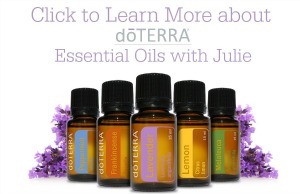 I had hoped that hubs would have given me one of these for Mother’s Day as I sure dropped a lot of hints :(. I would love one! I love, it’s all good! 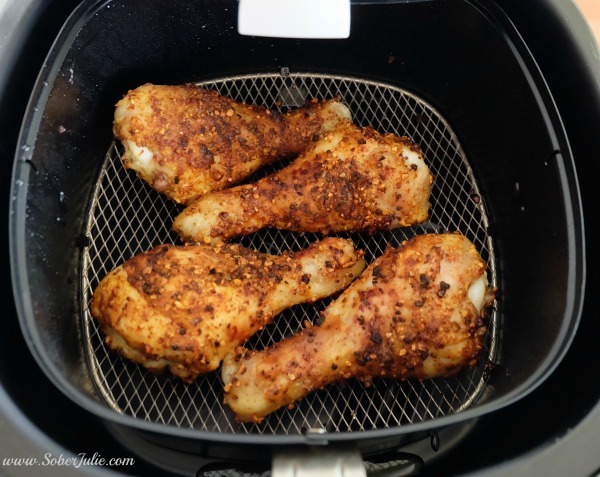 I have a AirFryer and do not know what I’d do without her! Do the fries actually turn out crispy? I tried frying them in the air-fryer and only the surfaces were crisp, the interiors were all soggy. Any suggestions as to what I might be doing wrong? Thank You! I just want to point out that in the instructions it says 200 degrees Fahrenheit, but the images show a C for Celsius. Seeing as 200 degrees Celsius is about 390 degrees Fahrenheit, that is an extreme difference and will create vastly different results; also, it goes on to say 150 degrees Celsius, which is about 300 degrees Fahrenheit. I did notice the same thing and was hoping someone would comment on the right temperature. so is it 390F ? . Yup! It worked out when I made them and I also see the article has been edited to include the Fahrenheit temperature. 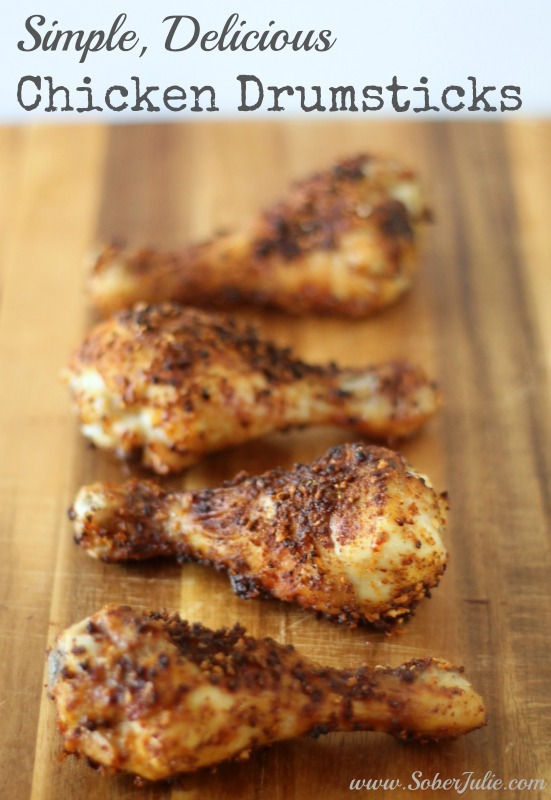 Thanks for these awesome recipes and I will definitely try them in my air fryer. 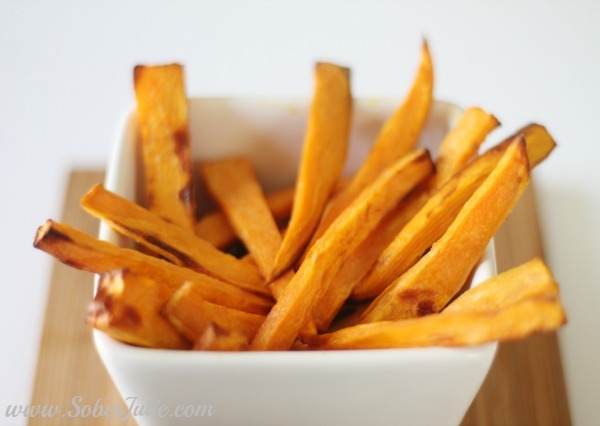 Can you use olive oil instead of coconut oil for the airless sweet potato fries? Did the sweet potato fries for the first time last night using your info. They did turn out great, but 200 didn’t work for me. I had to bump it up to 375 and I did it for 12 minutes, tossing once in between.